Non-invasive Prenatal screening (NIPS also known as NIPT) is a test offered to pregnant women at 10 weeks of gestation to identify the probability that the fetus has Trisomy 21 (Down’s syndrome), Trisomy 18 (Edwards’ syndrome) or Trisomy 13 (Patau’s syndrome). 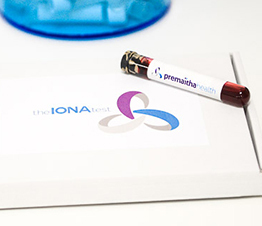 The IONA® test from Premaitha Health is the first complete CE-IVD test which analyses cell-free placental DNA in maternal blood samples. With its acquisition of Yourgene, Premaitha Health now offers additional testing for aneuploidies and microdeletions under the SAGE prenatal test.